Second, to differentiate its product from the plethora of available read-later browser companions and mobile apps, Readability spiced up its offering with a unique “support the publishers” spin that, as we detailed, allows users to pay for Readability and give 70% of their subscriptions back to the websites they read. Their new app is certainly gorgeous, but this second point really rubs me the wrong way — and it’s not Viticci’s fault. 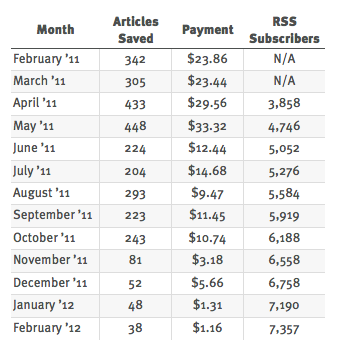 The thing is that when Readability launched I loved this idea of paying writers and it panned out for me to the tune of $20-25 a month. Not great, but heck it bought me a few burgers. As you can see in June of 2011 the service basically died for me. Maybe it’s because I have been outspoken about their business model/practices, maybe not. I have talked to a few others and they too have seen the same decline, so I don’t think it is just me. I included my Feedburner stats in the table so that you can see this is not due to a decline in my readership — the page views show growth as well. This decline has strictly been (from what I see) do to a decline in the usage of the Readability paid service itself. Perhaps these new iOS apps will change that, but I wouldn’t count on it.